REO Speedwagon has been around a very long time. Needless to say they have had their share of members in the band over the years. The steadying force known as bassist Bruce Hall joined the band in 1977 replacing original bassist Gregg Philbin. Bruce has been in the band ever since and gets his chance to perform his signature song “Back On The Road Again” every night. 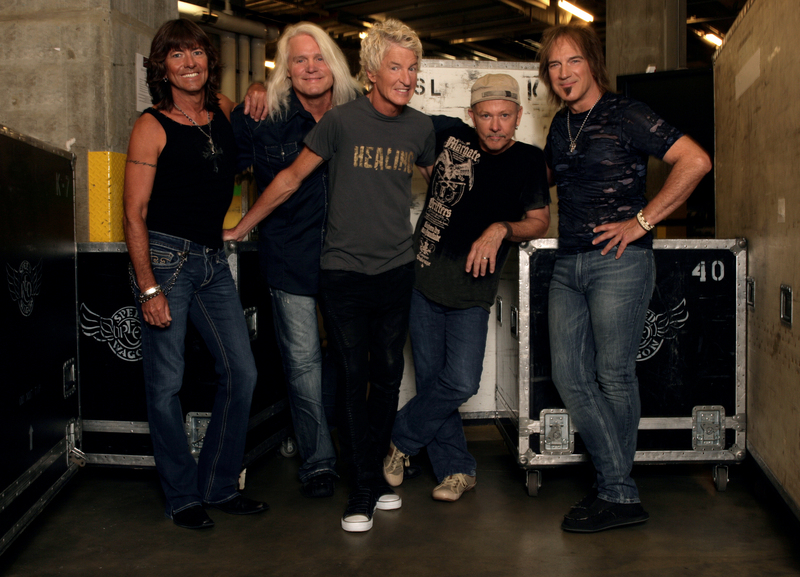 REO Speedwagon is currently on a big tour along with Styx and Ted Nugent. We were able to catch up with Bruce and chat while he was in Springfield, MO. Rock Show Critique: So how is the tour with Styx and Ted Nugent going so far? Bruce Hall: The tours been going great. We’ve played about ten shows and all the bands are getting along great. All the fans are having a really good time. It’s been real easy and very rewarding so far. RSC: Will the band be releasing any new music in the near future? BH: The band is always writing, we never stop writing. In fact we have a project going at the moment. We have fewer avenues it seems like these days and outlets for our music, radio used to be a little different. We don’t make records like we used to. If we write a good song then we run to the studio then record it that way. We are just waiting till we get a batch of songs together that we are comfortable with, the best we can do. We never stop recording and we never stop writing. Thats the artist in us we like to create, we’ll never give that up. I think these days its just as much fun to go on the road and play for the folks. They seem to want to hear the songs they’ve grown up with and heard before. We like playing those for them. RSC: Have you ever thought about making a solo record? BH: Sure its crossed my mind. The songs I write are a little different than what REO does and from what people are used to. Someday I may release one and see what happens with it. I got a lot of songs. Most of my stuff I use for myself. That’s a good question I never really contemplated going out as a solo artist or anything like that. RSC: Tell us about “The Girl With The Heart Of Gold”. What inspired you to write it? BH: “Girl With The Heart Of Gold” I wrote from the viewpoint of I was looking for her and I found her. It was a celebration song about how I found the girl I have been looking for. It was from a man’s point of view of looking and finding the perfect lady for his life. RSC: Who came up with the idea to have both you and Kevin sing it? BH: We’ve done that quite a bit. When I first met Kevin we used to sit around and play Beatle songs together. He would sing John Lennon parts and I would sing Paul McCartney songs. We like to that once in while. We’ve done it more than once actually. Sometimes it works sometimes it doesn’t. We don’t do it on Kevin’s songs so much but we try it on my songs. I don’t know why we just try and make it more interesting. It makes it more fun for us to record it. RSC: It seems like having two singers share the same song art is dead these days. You need the right song to do it with. It seemed to work good for Journey and a few other bands back in the day. BH: Yeah I think Henley and Frey used to do it off and on in some songs of the Eagles. With Kevin and I our voices are different, they don’t sound similar. When Kevin and I do it, its a noticeable difference when Kevin takes over the lead vocal. I like it. It’s fun, It’s interesting. We have so many songs, we’ve been around for a while. Well, on this tour we get to play seventy five- eighty minutes each night. We do a couple songs like “Golden Country” we do, we’re doing the song “Like You Do”. We don’t have enough time to do as many as we’d like to. One of these days it would be fun to play three hours or something, play a lot of songs. Maybe play a couple of records in order back to back or something. RSC: One of your best selling albums is 1982s Good Trouble. It featured several good tunes yet you guys never play anything from it live anymore? Is there a particular reason? BH: Well earlier this year we worked a couple songs off it. We worked up “The Key” and “Keep The Fire Burnin” but we’re not doing them right now. The Good Trouble record I liked that record, I always thought it was a good record. It was the record that followed the Hi Infidelity album. At the time of recording it and that time in our life, we had just come off the road, playing so many shows and we were super tired. We were trying to rest but we didn’t have time to do that. I know KC he thinks that it wasn’t some of his best songs. But I think it stands up just fine. I think “The Key” sounds great. I like “Keep The Fire Burnin”. On that record “Let’s Be-Bop” that’s an all right song I should have worked on it a little harder. I don’t know why I used the word Be-Bop for one, it should have been “Let’s Rock Tonight, (Laughs) now that I look back on it. It was an ok record, it was a rush job. The record company at the time wanted us to put out another record as quickly as possible to capitalize on the Hi Infidelity success. I think we would have made a better record if we had we taken a little more time to make the songs better. My songs especially could have been better. “Girl With The Heart Of Gold” was all right. “I’ll Follow You” that’s a good song. We try to write the best songs we can at the time. A lot of it has to to with the way your feeling and if your feeling really good and energetic I think we write better when we have time to rest. Good Trouble, I don’t dislike that album, but looking back on time we could have made a stronger record but it is what it is. RSC: How do you guys come up with a setlist with so many albums full of songs to choose from? Does Kevin handle that or is it a group effort? BH: It’s pretty much a group effort. First of all there are certain songs we have to play. That’s the reason people are buying the tickets. They want to hear “Take It On The Run”, ”Keep On Loving You”, “Can’t Fight This Feeling”, “Roll With The Changes”, “Time For Me To Fly” and for years now we do “Back On The Road Again”. So those are songs we pretty much have to do. So that’s up to six or seven already. This summer we’ve been doing “Golden Country”, that’s a good song that fits no matter what year it is. That one seems to pertain to this year especially. “Like You Do” and we’ve been doing another song “Son Of A Poor Man” we do that mostly for ourselves, its a rock n roll shuffle that we used to do back in the day. On the whole we try to give the folks what they want to hear and they always want to hear different ones. Usually its time, time is what keeps us from playing the more obscure songs. RSC: When was the last time you played “Say You Love Me Or Say Goodnight”? BH: Yeah I love that one. We were talking about working that one up for this tour. If we go out and start playing by ourselves we probably will be playing those songs live. Then we’ll have more time. We like to play at least ninety minutes if not more and that gives us a lot more time to put in another six songs, that helps. RSC: The album, The Earth, A Small Man, His Dog and a Chicken, was a big change for the band. What did you guys do different in the recording process of the record? Why were there no other songs written by you? BH: That right there was an odd time. The record I think was a good record we used a different producer for that one. A guy by the name of Tom Lord-Alge, he’s the one who put that real slick sound that sounds different from our other records. Kevin was also co-writing with Jesse Harms. At that point and time I was going through some things in my life. I was writing songs but there wasn’t too much that was I was real happy with. Basically I didn’t feel like I had enough to present. That’s a really good record too, I liked that one. For one I never really cared for the title. Its funny how that came about. We were looking for album covers and we had this artist who was drawing pictures for album covers. One of them he showed us was that one and he simply called it The Earth, A Small Man, His Dog & A Chicken. He’s thinking that we would change it to something else. We’ve always been interested in funny or different kind of album titles. Like You Can Tune A Piano But You Can’t Tuna Fish that kind of stuff. For some reason Kevin thought it was hilarious and I’m going “I’m not too sure about that”. But he kind of won me over. It was kind of funny. So we put it out there. About that time too the record companies were going through major layoffs and revamping so it just kind of got lost in the shuffle a bit and that was too bad. RSC: Over the years you guys have toured so many times, you probably can’t even remember every single one. But do you have a favorite tour? BH: I have to admit there have been a lot of great tours and you’re right its hard to remember them all. I can tell you every time we work with Styx, like we’re doing now, back in the eighties when we were both having our biggest records, there was a lot of competition involved. We always kind of use to say “Darn Styx” they were everywhere, we were right in their way and they were in our way and we were all battling for top tens and number one spot. Now there’s friendly competition. We flip flop every night on who is the closer. Ted opens up all the shows then its either Styx/REO or REO/Styx, it goes back and forth. It’s fun to get up there before the other band and if we’re in the middle slot we get up there and let the kids have it and say follow that and its fun we love them like brothers. We have the best time with those guys. RSC: In closing, you’ve played with a lot of different members in REO throughout the years do you still have contact with them? BH: Sure Mike Murphy, I played in a band with him before he was in REO Speedwagon, we were in a band called The One-Eyed Jacks. And also I played in a band with Gary before he was in REO Speedwagon called Feather Train. I don’t get to see Mike very often, I know he’s still living in LA. Gary is still in LA, I don’t see him very much I hear he’s married and seems to be happy. Alan we see more often, Alan comes out and sees us once in a while whenever we are in Reno, Nevada. Gregg we just saw not too long ago he lives in northern Florida. Everybody’s still around, everybody’s doin’ great. When we played in Champaign, just last year Terry Luttrell the original lead singer on the first album he was out and we gave him a big old hug. He’s doing good too and singing in a band called Tons Of Fun. It would be fun if we could somehow plan it to wrangle up everybody who was in Speedwagon like Terry, Mike and Gary and Gregg and get everybody together and somehow play a couple songs from each of the records with the original lineups, I think that would be something people might like someday. RSC: That would be cool. BH: Wouldn’t that be cool? I think it would be cool too. I don’t know if its possible but I think it’d be fun. Their guitar player Steve Scorfina quit REO Speedwagon that’s when Gary left my band Feather Train and he joined REO Speedwagon. He was just starting to get really good at that time. He learned how to write songs and was playing the guitar really great. That’s when Speedwagon started taking off. REO Speedwagon was starting to become one of the favorites for gatherings. As a kid I was a couple years younger than those guys. Neal started the band when he was a student at the University of Illinois with Alan. I was still in high school they were at least five years older than me. I was in bands since I was a kid. I’d go watch them play at the Red Lion, or in back of the student union. They were getting real good. Then Irving Azoff went on to discover REO Speedwagon, Dan Fogelberg and he moved to California and managed The Eagles and now he’s in charge of most of the world actually. Bunch of knuckleheads from Champaign, IL, we’ve done all right for ourselves. Special Thanks to Amanda Cagan from ABC Public Relations for setting up the interview.